The hypogeum of the Colosseum reopens this Saturday, April 7th. After being closed for nearly six months due to flooding, it's practically an Easter miracle! (And yes, officials announced today that it will be open in two days. Welcome to Rome). If you didn't even know that the Colosseum underground was closed, I don't blame you. Lots of tour operators were still selling the underground as if it was. But rest assured: It was. For more on the Colosseum underground, check out my previous posts. This post looks at the three major ways you can visit the Colosseum underground (all are tours). I also have a guide to how to book the Colosseum underground and a post highlighting what the Colosseum underground is really like. Happy underground-ing, and Buona Pasqua! Everyone’s still excited about the opening (and then re-opening) of the Colosseum’s hypogeum and third levels. Now, there’s more news. And it’s especially exciting for travelers hoping to get into the underground this summer. First, Colosseum has confirmed that it’ll be running tours of those newly-opened areas through July, rather than ending in June, as previously announced. * And, although it’s not confirmed, rumor has it that the hypogeum and third levels will proooobably also be open through October. *Addendum, April 5: After being closed due to floods, Colosseum officials just announced that the underground will reopen this Saturday, April 7. *Addendum, Oct. 20: The Colosseum hypogeum and third tier will be open through December. *Addendum, Sep. 25: The Colosseum underground will be open through the end of October. Second, before, the Colosseum only was allowing access to the hypogeum and third level via its own tours, given by official Colosseum guides. (Even tour agencies selling the Colosseum underground hand their clients over to official Colosseum guides for the underground part of the tour). But that’s changed. Now, one agency, Walks of Italy, is using its own guides for the hypogeum and third level on the VIP Colosseum underground tour. And, although I’m obviously a bit biased (full disclosure: I used to work for these guys), I think this is an alternative to consider. Why? Well, even though the official Colosseum guides know their stuff, they can also be a bit, erm, dry. (Your spiel would start to sound dull, too, if you’d been repeating it five times a day for the past 10 years). And not all of them speak that great of English. So, from what I can see, there are now three main ways to get into the Colosseum’s underground. Colosseum tour only, with a Colosseum guide. I outlined how to book this tour in an earlier post about booking the Colosseum’s underground. 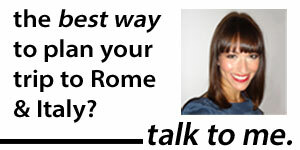 The cheapest way is to book by phone, at least if you have Skype’s Skype-to-phone set up or a great long-distance plan. Otherwise, you can book by using a website like Omniticket, but these sites charge a premium for the convenience. (And all they’re selling you is the official Colosseum tour that you’d get by calling Pierreci). The facts: Costs €21.50 (if you book directly over the phone). Takes about 1 hour. Only covers the Colosseum and its underground. You use an official Colosseum guide (not always a good thing). Maximum group size is 25. The complete ancient city tour, but where you’re handed over to a Colosseum guide. This option would be Dark Rome’s Colosseum underground, forum and Palatine tour. They’re one of the only agencies I can see that offers access to the underground as part of a bigger ancient city tour (i.e., not just the Colosseum), but they don’t do the Colosseum underground part with their own guides. The facts: Costs €92. Takes 3.5 hours. Includes the Colosseum and its underground, along with forum and Palatine. For the Colosseum part of the tour, you’re handed over to an official Colosseum guide; for the rest of it, you use a Dark Rome guide. Maximum group size is 10; for the Colosseum part, it’s 25 (since you’re put onto the bigger group). The complete ancient city tour, with your own guide throughout. So far, only offered by Walks of Italy on its VIP Colosseum Underground Tour with Roman Forum & Palatine Hill tour. The facts: Costs €79. Takes 3 hours 15 minutes. Includes the Colosseum and its underground, along with the forum and Palatine. For the Colosseum part of the tour, you get to keep your own Walks of Italy guide. Maximum group size is 12, throughout the whole tour (since you get to keep your guide). Rome’s Best Archaeological Museum: Have You Been? The Colosseum’s Underground… Has Re-Opened! Good news: The hypogeum, arena and 3rd level of the Colosseum are open as of today, March 12. Update, October 2011: The Colosseum underground and third level will be open through Dec. 31. Update, September 2011: The Colosseum hypogeum and 3rd tier will be open through October 2011. 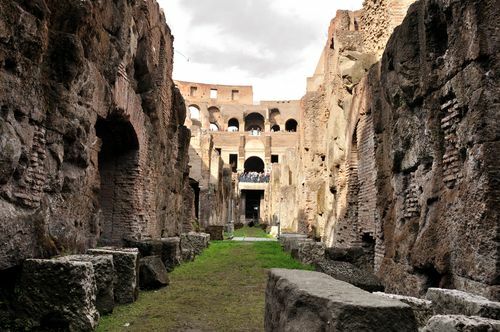 Update, June 2011: Here's updated info on the Colosseum underground, including how it will be open through July and what tour options you have for seeing the underground. The woman at Pierreci said that they aren't accepting reservations for today or tomorrow, so if you're looking to check the newly-restored areas — closed again since Nov. 30 — out over the weekend, go directly there. But from Monday, you can make reservations for the tour that takes you into the hypogeum — the underground, "backstage" area where gladiators and animals would have waited for their turns to fight — and up to the third level, as well as onto the arena. As in the fall, you can't see these areas without a guided tour. Unlike in the fall, Pierreci says that when you book, you also have to pay by credit card in advance. Pierreci told me that the cost is €9 for the guided tour, plus the €12 entrance ticket, and they said there is no reservation fee. English tours are offered daily at 9:40am, 12:20pm, 1pm, 3pm, and 4:20pm. To book, call +39 0639967700. (They should speak English). As anyone who's been to Italy knows, things are always changing here — or one department might say one thing, but another might say something else. So if anyone has a different experience with this, please let us know in the comments. Here are more photos and the story of what it's actually like if you're curious what all the hypogeum hubbub is about. And while some of the particulars of how to book have changed, this Q&A on how to see the Colosseum's underground should still be helpful.